The passing of John 'Shoes' Moshoeu has robbed South Africa of one of its greatest footballers. 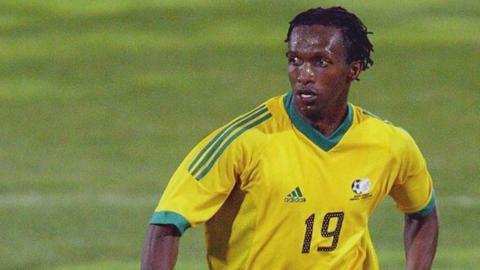 The former Bafana Bafana midfielder, who captained the side on three occasions, lost his battle against stomach cancer on Tuesday at the age of 49. He leaves those who saw him play with indelible memories of his ability, his warm personality and his humility. And he will also be remembered for being the standout performer in the South Africa side that won the 1996 Africa Cup of Nations - their feat remarkable given they had returned only four years after the end of a decades-long international sports ban because of apartheid. He played 73 times for Bafana Bafana and scored eight goals, four of them coming when they lifted the Nations Cup trophy on home soil - their first appearance in the tournament. Perhaps the most important of those goals was the winner he struck in a 2-1 victory over Algeria in a tense quarter-final in front of 80,000 fans at Johannesburg's FNB Stadium. "We were leading 1-0 with about five minutes to go when Algeria equalized. I was looking up at the big clock in the stadium, still battling to deal with the disappointment of conceding so late. When I focused on the game again, I saw that Shoes had put the ball in the back of the net and had already started celebrating," recalls Andre Arendse, the team's goalkeeper. Moshoeu also scored twice in the 3-0 semi-final victory over Ghana, in what is still ranked by many as Bafana's finest performance since they returning to international football in 1992. For some in the Bafana camp, he was just as influential off the pitch. Still shaken after hearing the news of his former team-mate's demise, Arendse recalls how he always loved listening to Moshoeu deliver words of wisdom. "He just made so much sense whenever he spoke that I often told him if he weren't a footballer he would have been a philosopher!" In his club career he starred for Kaizer Chiefs in South Africa ad for Gencleberligi, Fenerbahce and Bursaspor in a 10-year stay in Turkey. Moshoeu was instrumental in Kaizer Chiefs winning back-to-back league titles in 2004 and 2005 seasons under coach Ted Dumitru. "Shoes was a special, multi-faceted player. He had skill, intelligence and character," said Dumitru. "Such was his influence in the team that if he wasn't playing you felt you were playing with five or six players instead of the 11 we had on the pitch. The fact that he was our top goal scorer while playing in midfield when we won the league the first time speaks volumes about his quality as a player. "As a person he was humble and very respectful. It was wonderful working with such a special player and person. It's a big loss to South African football. Moshoeu initially failed to make the first team at Kaizer Chiefs, but the Soweto giants realised their error when they signed Moshoeu in 1993 from lowly Giant Blackpool after he showed his class by taking the team to the final of the JPS Cup in 1991. He rejoined Chiefs upon his return to South Africa after a successful decade in Turkey. Wearing the number 91 shirt ("9 and 1 adds up to 10" he told me at the time) because his favourite number 10 shirt had already been taken, the classy midfielder not only helped Chiefs win successive league titles but he was also selected for the 2004 Nations Cup in Tunisia at the age of 38. Such was his physical shape that the midfielder continued playing for AmaZulu in South Africa's Premier League until the age of 42. Before being struck down by illness Moshoeu was involved in social responsibility programmes and helped aspirant young players trying to forge a career in the professional ranks.